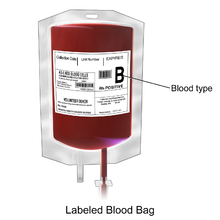 Bag of packed red blood cells. ↑ ୧.୦ ୧.୧ ୧.୨ ୧.୩ Connell, NT (December 2016). "Transfusion Medicine". Primary care. 43 (4): 651–659. PMID 27866583. ↑ Carson, JL; Guyatt, G; Heddle, NM; Grossman, BJ; Cohn, CS; Fung, MK; Gernsheimer, T; Holcomb, JB; Kaplan, LJ; Katz, LM; Peterson, N; Ramsey, G; Rao, SV; Roback, JD; Shander, A; Tobian, AA (15 November 2016). "Clinical Practice Guidelines From the AABB: Red Blood Cell Transfusion Thresholds and Storage". JAMA. 316 (19): 2025–2035. PMID 27732721. ↑ Plumer, Ada Lawrence (2007). Plumer's Principles and Practice of Intravenous Therapy (in ଇଂରାଜୀ). Lippincott Williams & Wilkins. p. 423. ISBN 9780781759441. ↑ Parsons, Polly E.; Wiener-Kronish, Jeanine P. (2012). Critical Care Secrets5: Critical Care Secrets (in ଇଂରାଜୀ). Elsevier Health Sciences. p. 385. ISBN 0323085008.